Blogging - Is it worth it? During Marketpath’s first discovery meeting with clients we always encourage them to add a blog to their new website. The typical response we get in return is “Is blogging worth it?” More times than not a client is hesitant to add a blog feed to their website as it has to be constantly updated or their site will look and feel outdated. As a small business, companies worry about having the time to create successful blog content. They also worry about the frequency of blogging. While the fears our clients have are legitimate concerns, the positives of blogging far outweigh the negatives. There are many benefits of blogging. Not only is it an easy way to keep your website fresh and updated, but it gives your company an opportunity to position yourselves as experts in your industry. I am here to share a few statistics that will convince you that blogging is a necessity for your website. If your company produces a blog that continues to slowly draw traffic over a long period of time, then this blog can be recycled throughout your social sites and newsletters until the life of the blog takes its course. Not every blog your company will write will be a homerun, but 1 compounding, successful blog post will generate as much traffic as 6 decaying posts (blogs that have a decline in traffic over time). Learn more about compounding and decaying blog posts. One deterrent most people face when blogging is assuming that every blog post has to be 1500+ words. Think outside the box by writing list blogs that people can skim easily. For example: “5 lazy social media habits and ways to avoid them.” It doesn’t have to be a long blog post to get your point across! Although longer posts are certainly valuable, due to rich content and SEO benefits, shorter, more reader friendly posts are also great to mix in and are way better than not posting! While most small businesses might not have time to write 11 blogs a month, this statistic shows that if you can increase your blogs even by 2 or 3 a month the amount of leads you receive from blogs will only increase! Try and block out time during the week for blog writing. Once you start it’ll be easier to come up with content! Try and consider industry-related blog ideas and posts related to FAQs - in many cases people are using Google to search for answers you can provide. And these posts will perform better organically in Google. Brainstorm blog ideas as a team. Do you have any great blogging tips? Comment below. Does your company need help with a blogging strategy? We are here to help! Contact us today. 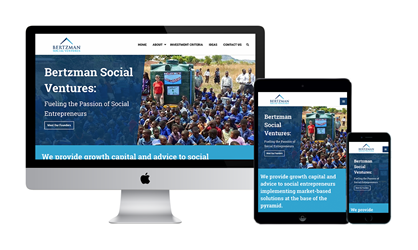 Bertzman Social Ventures is fueling the passion of social entreprenueurs.